Wonderful audio performance. with excellent bass depth and clarity. Superb sense of space. Comfortable, secure fit. Huge frame and open-back style earcup not ideal for on-the-go listening. Expensive. Lacks a cable with an inline remote control. We’ve reviewed only a handful of planar magnetic driver-based headphones thus far, like the Blue Ella and the in-ear Audeze iSine20. Now, we check out the bulky, beautiful, and—at $599.99—expensive Acoustic Research AR-H1. 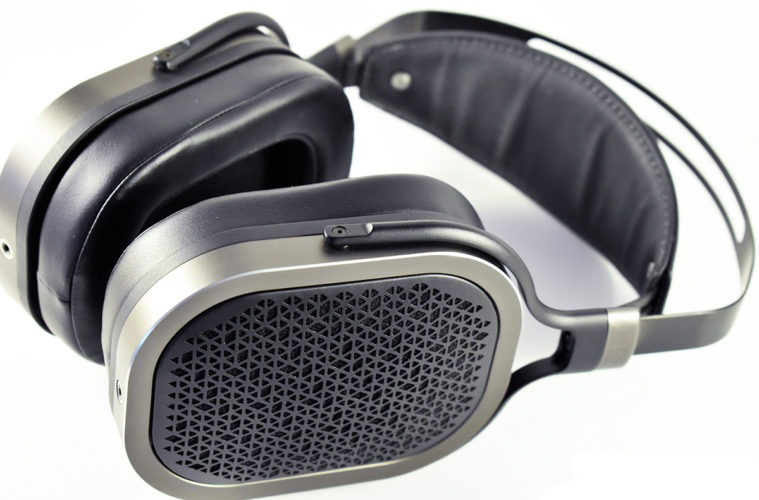 Even without its own internal amplifier like the Blue Ella has, the AR-H1 is among the best-sounding headphones we’ve tested in the last year. It easily wins our Editor’s’ Choice award, justifying its high price by delivering the kind of sonic clarity, accurate bass response, and sense of space that audiophiles yearn for. The circumaural (over-the-ear) frame of the black-and-brownish gray AR-H1 is somewhat imposing, to say the least—it’s chunky and looks like it might be quite heavy. 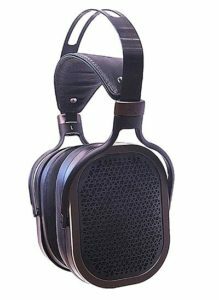 A leather headband strap makes contact with the scalp while a metallic band above it holds tension, and the leather-lined, rounded rectangular earcups take up quite a bit of facial real estate. The AR-H1 is also an open-back style design, projecting some audio outward through a classy metallic grille design. All of these elements add up to a headphone pair best enjoyed at home, and perhaps when others aren’t around. The fit is exceptionally comfortable, even over long listening periods, though some users might find that the massive ear pads press against different parts of the face than they’re used to. 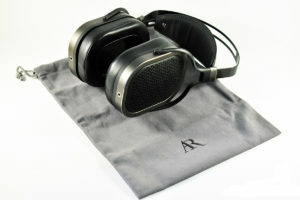 Inside each massive earcup, the AR-H1 employs a 86mm planar driver. For those unfamiliar, this style of driver is wide, thin, and flat, essentially providing better transient response and a flatter, more consistent impedance across the frequency range. More conventional dynamic drivers, for comparison, are dome-shaped and can have a varying impedance depending on the frequencies being reproduced. Dynamic drivers are typically attached to voice coils and pushed from those connection points, while planar magnetic drivers are pushed to vibrate evenly across its wide surface. Planar magnetic drivers require less power to be driven louder, can have a faster response to transients, and tends to deliver a more accurate frequency response as a result. 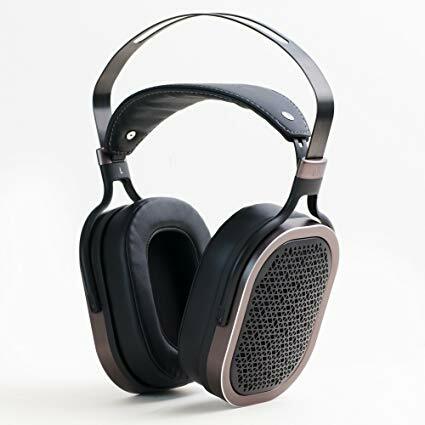 Acoustic Research estimates the AR-H1’s frequency response to be 10Hz to 70kHz (a reminder here that human hearing is usually limited between 12Hz and 28kHz, but more range can’t hurt) and its impedance is 33 Ohms. 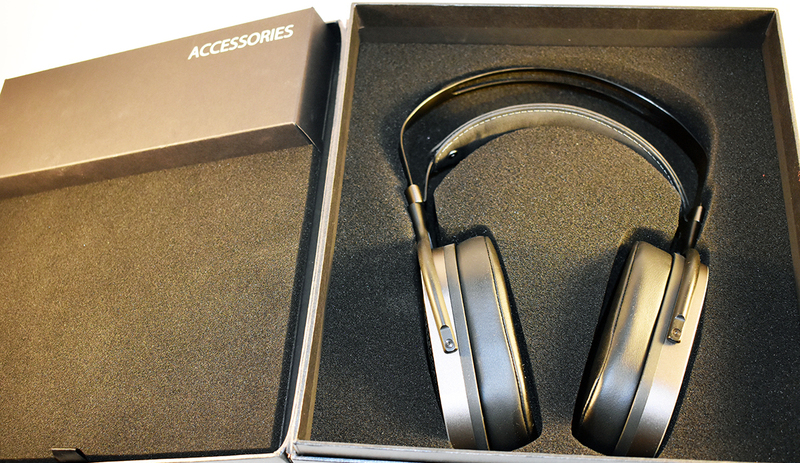 The AR-H1 ships with a thick, 47.2-inch-long audio cable that splits near mid-torso and connects to the lower outer panels of both earcups. We wish the cable was a tad longer for home theater-style scenarios. 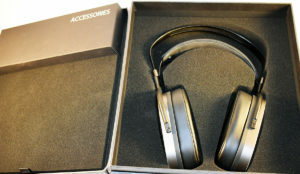 It lacks an inline remote control, as the headphones are intended for home or professional use. They can still be used with mobile devices, since the cable terminates in a 3.5mm plug. A 1/4-inch stereo plug adapter for home stereos and studio gear is included. It would have been nice to see a second cable at this price to provide the option of an inline remote control to use with phones and tablets. Other than the cable and the adapter, the AR-H1 ships with a gray drawstring protective pouch. For this review, we used an Apogee Symphony I/O and an iPhone 6s as sound sources. On tracks with intense sub-bass content, like The Knife’s “Silent Shout,” the AR-H1 delivers a clean, impressive low frequency response. We get all the rumble that this song packs, but there’s also a sense of space, and the pumping bass doesn’t overpower the rest of the mix, as can sometimes happen. It’s forceful for sure, but it provides a solid representation of the higher frequency mix elements. Bill Callahan’s “Drover,” a track with far less deep bass in the mix, gives us a better sense of the AR-H1’s general sound signature. The drums on this track are given a wonderful depth and a sense of space. The AR-H1 delivers the drums with plenty of low frequency thump, but we also get a sense of the higher frequency attack of the taps. We hear their reflections and get a sense for the kind of space this recording was made in. Callahan’s baritone vocals have a wonderfully rich presence in the low-mids here, but they also have an equally crisp edge to them in the high-mids. The guitar strums and higher percussive attacks on this track are delivered with brightness and life, especially on the reflections of the higher percussive hits. Whether it’s the planar drivers or the open-back design or both, the AR-H1 creates an excellent sense of depth and space. Jay-Z and Kanye West’s “No Church in the Wild,” the kick drum loop’s attack gets the ideal amount of high-mid presence, keeping its attack sharp and allowing it to cut through the layers of the mix as a prominent force. The sub-bass synth hits that punctuate the beat are delivered perhaps with less subwoofer-like gusto than some listeners might want—this is more of a flat response-style headphone pair. But that shouldn’t be confused with the headphones sounding thin or brittle. There’s plenty of bass depth here, but the low-end is delivered cleanly and without mega-boosting. In fact, every aspect of the sound signature is about clarity and detail first. There’s bass, but it never duels for the spotlight with the vocal performances, which are never too sibilant despite a lovely brightness. Orchestral tracks, like the opening scene in John Adams’ The Gospel According to the Other Mary, sound stunning through the AR-H1. The lower register instrumentation is given the ideal amount of bass depth and presence. Once again, we can really get a sense of space and detail thanks to the open-back design, and perhaps that fast transient response the planar magnetic drivers are known for. The attack of the higher register brass sounds fantastic here, and the strings are delivered with lovely detail. The reflections in the room, as on the Callahan track, seem to be easier to pick up on through the AR-H1. They sound particularly wonderful on the choral parts and higher register trumpets. Listening to music through the AR-H1 is a pure joy, which is why they easily win our Editors’ Choice award. If you’re interested in an open-back style planar magnetic headphone pair, the AR-H1 won’t likely disappoint. Some listeners might prefer a smidge more bass depth, but that is where some stereo receivers might come in handy, and I personally didn’t feel the sound signature lacks in that department. This is a wonderfully accurate audio experience, ideal for music lovers or sound professionals wanting to check their mixes. The aforementioned Audeze and Blue planar magnetic headphones are also solid options. If you’re looking to spend a bit less on a still-accurate-sounding circumaural pair, consider the Beyerdynamic DT 880 Pro and Sony MDR-1A—both offer excellent audio experiences, though not of the planar magnetic variety. For $600, the Acoustic Research AR-H1 delivers on the promise of planar magnetic drivers, and it looks and feels good doing it.